Something is happening in Old Town... and it's not good. First one of my favorite Italian restaurants closes and the building gets converted into law offices (why do lawyers need prime retail space?). Ok, I know that happened some time ago, but I still mourn the loss. Then, just recently Barker Road announced they were closing, then I hear the Sandpiper art gallery next door closed (UPDATE: this last one is not true!). After a visit with my dentist in Old Town, I decided to pay a visit to Old Town Photo. Several people have mentioned that I should meet with the shop's owner, Ron Karabaich because of our shared interest in Tacoma history and photography. Ron comes from an old Tacoma family. His father family ran the original Old Town Dock seafood store (before the current one replaced it). After a hellish time in the chair that morning, I'm glad there was something good that came out of my visit to the dentist! I ended up having a great conversation with Ron who gave me a tour of his studio along with the news that he was closing shop. He will still be doing some framing and taking amazing panoramic photos using historic equipment (as long as they still make film!) - but he will be working out of his home around the block. The store as a presence will be gone after 32 years. That is a long time! I'm glad I got a chance to see his shop before it closed. If you head down there you might be able to catch him as he packs up. He has filled the walls with panoramic photos - some historic, some not - and they're all for sale. I asked him if he had looked into getting an online store to which he replied he hadn't although he had thought about it, so I check out the Feed. Let's hope he does - he has some very cool images. He had an extra photo kicking around that he was nice enough to give me because it featured a few streetcars. 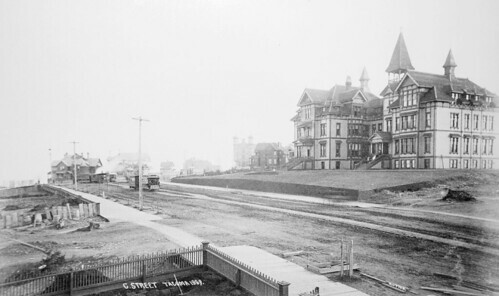 The image is taken in what is now the Stadium District and shows the original building and location of Annie Wright before it moved to it's current location. Running down the dirt street are some steam powered streetcars. by fredo on 11/30/2008 @ 6:29am Yes Morgan, what's happening down in Old Town is really quite a shame. This little business district used to have lots of quaint little shops, even a small grocery store. Inch by inch the area is being taken over by service providers the same as the Proctor neighborhood. The service providers are all nice people but they don't really contribute to providing pedestrians with a reason to congregate. Furthermore, service providers rarely stay open in the evenings so the whole area just goes dark after 5. Nice picture in your posting, thanks. by morgan on 12/1/2008 @ 11:50am Thanks- I tried to place where the photo was taken. I was told it was on Tacoma Avenue, but the photo says "C" street which was the original name for Broadway. If that's the case, then Broadway used to continue through the Stadium District through what is now the alley between that new ugly building between Stadium High and Ranko's - and that's where the photo was taken. With all this talk about saving Wall Street and Main Street, I just wonder who will be left to save on Main Street. by morgan on 12/1/2008 @ 3:38pm jcbetty: Doh! I missed the retraction. Glad to hear though.